Fire prevention slogans ideas for workplace communication safety campaigns. How many companies have you worked in where there is a fire drill? The reason for this is to prepare staff in cases of emergencies. 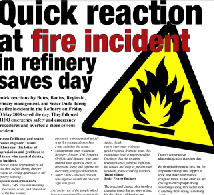 Safety and fire awareness is a crucial part of safety in any company. Use fire prevention and safety slogans in order to bring the message across with regard to workplace safety. Create slogans relevant to your company's safety message. Refer to earth day slogan to see how many slogans can be created on one topic. Campaigns, of which posters are an element should be devised to keep fire prevention top of mind. Fire prevention slogans to promote safety could really be used in an effective manner as part of these campaigns. They will make it eye catching and will brand the campaign, making the promotion of elements quick and easy. 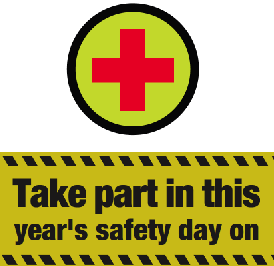 Run a staff competition to select the best safety slogan. This gets your staff buy in, gets them thinking about fire prevention slogans and starts the promotion of your campaign. This will not only create awareness about preventing fires but it will also gear everybody up and prepare them should a fire occur. There is even a fire prevention week. Fire prevention tips and a fire prevention plan need to be promoted. In addition the procedure that should be followed if there is a fire or if someone has been injured. Fire safety competition, fire prevention parades and practices should be held as part of safety training and awareness. You can run joint initiatives with other companies. We can help you prepare a safety or fire prevention campaign for your company. Flames fire graphics for fire safety posters and work place safety posters - Flames fire graphics and other fire images can be downloaded to use on fire safety posters. Safety meeting topics - good persuasive topics to discuss in workplace safety meetings - 18 safety meeting topics and rules for running a meeting to keep the workplace safe. Free safety presentations, rules for running a meeting to promote workplace safety - Free safety presentations and ideas for promoting workplace safety and the steps involved in running a safety presentation. One of the most important methods of safety prevention is to conduct regular meetings and presentations. These free meeting agenda templates, free safety presentations and creative presentation ideas will be helpful. There are also tips and rules for running a meeting and ice breakers for staff meetings to make meetings more interesting and productive. Catchy safety slogans make a campaign more memorable. Get staff to share their fire prevention slogans and offer a prize for the best slogan.